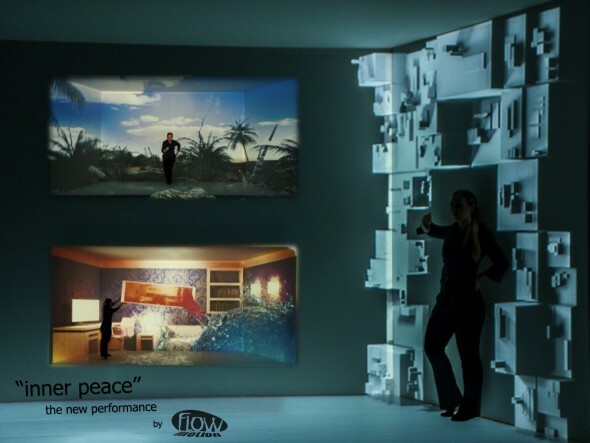 “Inner Peace“ is our first 3D-mapping-dance-piece. It combines real 3D-mapping with dance in a live performance. The creation of this production was quite a challenge. The floor is sloping, which made a special training for the dancer necessary, and we aimed for a setup that only requires one projector but still allows the maximum of visual effects. Basically we wanted all, with the littlest amount of setup. The final result is impressive. The visual effects exchange flawlessly so they allow the audience to focus on the storyline. A journey to oneself – thrilling, breathtaking, intoxicating.